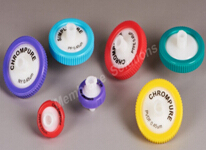 Membrane Solutions’ new 17mm syringe filters have color-coding housings providing easy identification of membrane and porosity. Their enhanced luer-lock inlet provides secure connections and eliminates filter 'blow-off'. 17mm syringe filters supplied Nylon, PTFE, PES, MCE and PVDF which available in 0.22um, 0.45um pore sizes. 17 mm syringe filters (upper) offer up to 70% more filtration area than traditional 13 mm filters (lower). Filter Ø: 17 mm ；Filtration area: 130 mm2 ，has more than 40% larger filtration area than the 13 mm filter.